Is Luxchem Corporation Bhd Worth Investing In Now? In 1984, Mr. Tang Ying See quitted his job as a Senior Manager of a chemical trading company to start his own business. It was a sole proprietorship and it was into marketing of industrial chemicals known as Lux Trading. Four years later, Madam Chin Song Mooi, his wife, quitted her job as an accountant in a building and construction company to help build her husband’s business. 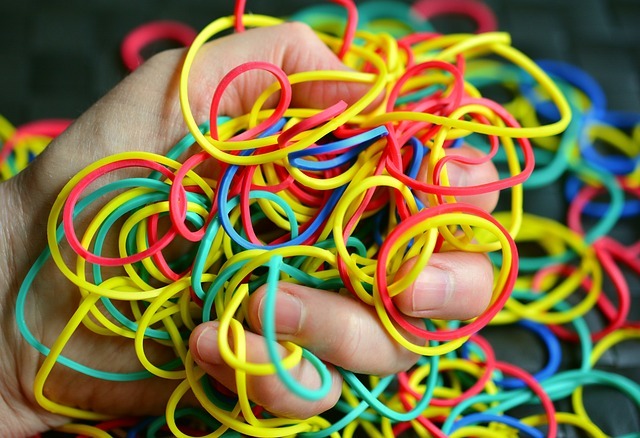 The husband and wife duo had grown their businesses rapidly. Subsequently, in 2008, they have listed their businesses on Bursa Malaysia under the listing name: Luxchem Corporation Bhd (Luxchem). Since then, it has matured and become a main player in the industrial chemical industry in Malaysia. Today, as I write, Luxchem is valued at RM 540.7 million in market capitalization, a multiple of 7.2 times from RM 74.8 million as of 31 December 2008. 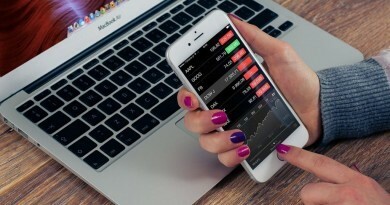 In this article, I’ll share 8 main things that you need to know about Luxchem before you invest. It imports, exports and distributes a wide range of petrochemical and other related products through four subsidiaries which are located in Malaysia, Singapore, Indonesia, and Vietnam. These products mainly are sold to manufacturers in the Rubber, Latex, Fibreglass Reinforced Plastic (FRP), Coating, Ceramic and Polyvinyl Chloride industries. In 2017, the trading segment has generated RM 653.6 million in revenue or 81% of the total revenue for Luxchem. Thus, it is the main revenue contributor to Luxchem. It manufactures Unsaturated Polyester Resin (UPR) under Luxchem Polymer Industries Sdn Bhd. In 2017, Luxchem has spent a total sum of RM 45.5 million on acquiring 100% interests in Transform Master Sdn Bhd, a company which is involved in latex chemical dispersions, latex processing chemicals, and specialty chemicals manufacturing & trading for the latex industry. Export sales had accounted for 76% of Luxchem’s total manufacturing sales in 2017 where its key customers are from Vietnam, Thailand, Bangladesh, Australia and Singapore. In 2017, the manufacturing segment has generated RM 153.1 million in revenue or 19% of the total revenue for Luxchem. Thus, it remains a smaller contributor of sales to Luxchem. Since 2008, Luxchem has delivered consistent growth in both group revenue and shareholders’ earnings to its shareholders. Sales have increased from RM 331.6 million in 2008 to RM 806.7 million in 2017. Shareholders’ earnings had grown from RM 18.0 million in 2008 to RM 40.7 million in 2017. 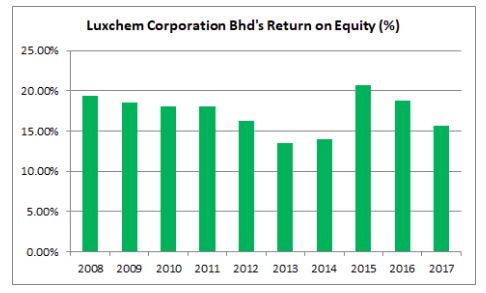 Luxchem has achieved a 10-Year Return on Equity (ROE) average of 17.33% a year. 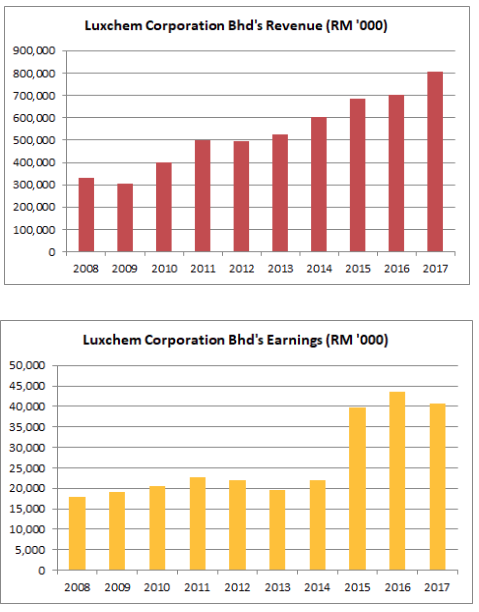 It means, Luxchem has generated, on average, RM 17.33 in earnings per year from every RM 100.00 in shareholders’ equity from 2008 to 2017. As at 31 December 2017, Luxchem has reported a total of RM 1.89 million in long-term borrowings. Hence, its gearing ratio works out to be 0.73%. 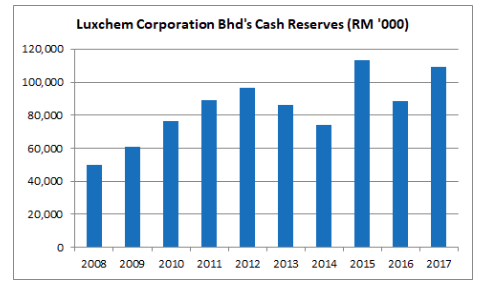 In the last 10 years, Luxchem has increased its cash balances from RM 49.9 million in 2008 to RM 109.1 million in 2017. As such, this indicates that Luxchem is a low-geared company and one that is capable of growing its cash reserves on a consistent basis. Presently, Luxchem Polymer Industries Sdn Bhd is capable of manufacturing 30,000 metric tons of Unsaturated Polyester Resin (UPR) annually. 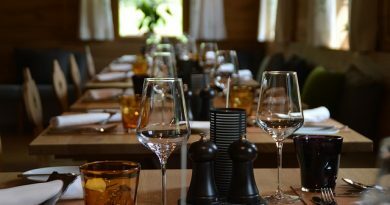 Based on the management, it is operating close to its full capacity. Towards the end of 2017, Luxchem Polymer Industries Sdn Bhd has expanded its capacity up to 40,000 metric tons. Luxchem is expected to utilize the additional capacity of 10,000 metric tons starting in the second half of 2018. In 2017, Transform Master Sdn Bhd has an annual capacity to produce a total of 9,600 metric tons of latex related products as stated in Point #2. Currently, it is also running on full capacity. In Q4 2017, the management has started to install additional machineries which has expanded its production capacity to a total of 13,800 metric tons per annum in Q1 2018. As I write, Luxchem is trading at RM 0.64 a share. In 2017, Luxchem has reported earnings per share (EPS) of 4.7 sen. Hence, its current P/E Ratio works out to be 13.62. In 2017, Luxchem has reported to have RM 0.31 in net assets a share. Hence, it has a current P/B Ratio of 2.06. In 2017, Luxchem has declared RM 19.76 million in dividends. According to the number of ordinary shares issued of 844.85 million, its dividends a share works out to be 2.3 sen. If Luxchem is able to maintain its DPS at 2.3 sen for year 2018, its expected gross dividend yields works out to be 3.65% if I invest in Luxchem at RM 0.64 a share. Mr. Tang Ying See and his wife, Madam Chin Song Mooi are ultimately the largest shareholders of Luxchem Corporation Bhd via their direct interests in Luxchem and indirect interests held with Chemplex Resources Sdn Bhd and their son, Tang Chii Shyan. Presently, Mr. Tang is appointed as CEO while his wife, Madam Chin Song Mooi is appointed as an Executive Director of the company. Is Starburst Holdings Ltd (SGX:40D) a Potential Growth Story? Are We Heading For A Stock Market Crash?